Today world leaders have finally called on the lion to step down. Let’s hope he does, and without delay although I am not holding my breath. Anyhow, it is a significant development and to celebrate I decided to give you a recipe from my favourite restaurant in Damascus, Khawali, for one of the best hommus ever. The Syrians don’t put garlic in hommus and if they do, they also add chopped parsley and call it hommus Beiruti. At Khawali they have the regular version and their own hommus Khawali to which they add pepper paste and pomegranate syrup. The charming manager at Khawali explained to me how their hommus was prepared but he was not able to give me exact measurements. After a few trials, I think I have perfected a version that is almost as good as theirs. Mine is not as creamy but that is because I don’t peel the chickpeas. I could if I wanted to but I can’t be bothered. In fact, we recently had a lengthy discussion on twitter following Felicity Cloake‘s article on how to make the perfect hommus on whether to peel them and whether to cook them or use canned. 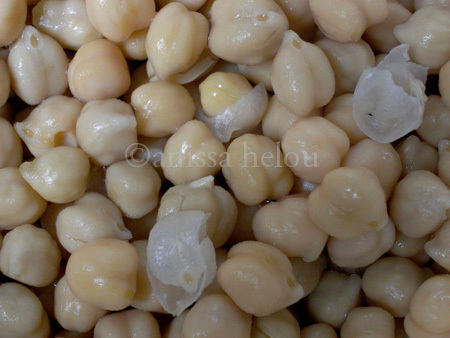 Peeling them does make a difference and the easiest way to do this is to run cold water over the cooked chickpeas and rub them gently to losen the skins. As the water runs, the skins will float to the surface at which point you can either skim them or pour them off. Even if you manage to peel only half, you will notice a difference. As for cooking them, I no longer do. Instead, I use those preserved in glass jars with only salt and water and no preservatives. A little more expensive but a real time saver without any compromise on the quality. After that it’s a cinch. All you have to do is put the chickpeas in a blender together with the pepper paste (the best you can get; I bring mine back from Aleppo or Gaziantep! ), pomegranate syrup, tahini and lemon juice and whizz until very smooth. You will not need any salt if you use the chickpeas in a jar. And if you cook your own, remember not to add salt until the very end otherwise they will not cook properly! Drain and rinse the chickpeas. Put in the food processor. Add the tahini, lemon juice, pepper paste & pomegranate syrup and process until very smooth. Transfer to a mixing bowl. Add salt to taste. Mix well. If the hommus is too thick, thin it by adding a little water, or a little more lemon juice, if it is not already tart. Taste and adjust the seasoning. 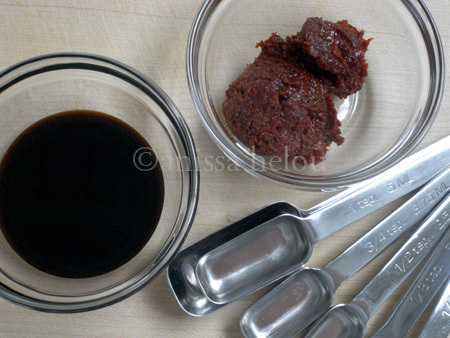 Pepper paste and pomegranate syrup can be ordered from http://www.tulumba.com. for sure. i like to sprinkle more pepper but the sumac will give it a nice tart note 🙂 glad you like the sound of this hommus. Looks fantastic. Can I just ask a couple of questions? – in the top photo, you’ve poured olive oil into the well in the centre of the hommus, yes? – is the pepper you’ve sprinkled over powdered or flaked (these old eyes can’t make it out). I never knew Syrians don’t put garlic in their hummus! Very interesting recipe for sure. I will definitely try this. I have made a chocolate hummus lately (recipe still being perfected lol), an avocado one, a roasted red pepper one..and the other day I saw a bakery with pistachio hummus which I’m dying to try! i have to admit that i am not so keen on the various flavoured hommus creations but this one is v close to a real one except for the gentle heat and the v subtle sweet-sour flavour imparted by the pomegranate syrup. and the colour is v pretty. let me know what the pistachio hommus is like. as for a chocolate one, hmmm… is all i can say :). for now at least, until you report back. Anissa, I know what you mean. For the longest time I was a hummus purist, and I scoffed at any “impure” ingredients touching that creamy velvety chickpea gold. What changed my mind was my husband. While he loved the traditional hummus, he would request the roasted red pepper one incessantly to snack on. I love the addition of pomegranate syrup. I think I’ll make this today, since I have all the ingredients in my pantry. Yay! I love pomegranate syrup. Thanks for one more great reason to use it. yes, even in aleppo. the one that has garlic and parsley is called hommus beiruti which is strange cos we don’t have it in beirut. we have plain, with qawarma or simply pine nuts. the interesting thing is that i think they also don’t use garlic in tripoli where i had one of the best hommus ever, in the mina at an old man who’s famous for his hommus and at the silver shore where they garnish with samneh and toasted walnuts. mmm…. This is wonderful and reminds me of how I prepare Baba Ganoosh. I have some Syrian friends (AlJandali family) out of Damascus and they prepare hommus with garlic, but perhaps they just forget to say it is Beiruti hommus. Anissa…do you have a recipe for Fattet Hommus? This is my favorite. The only people I know who make this are the Syrians. Fascinating blog!! !..I like you am not keen on various hummos flavors//the whole point is missed which is the nutty creamy earthiness of the chickpea.sometimes I see these crazy combos and am rolling my eyes!! !this however seems delicious..A dear Palestinian/Jordanian friend of mine told me that you could buy skinned fava for falafel making but that you would need to peel the chickpeas to mix with the favas..I suppose for hummos you must have skins on to cook and then peel or they would get water logged or can they be bought skinned like the fava in dry form? instead of pepper paste (?) 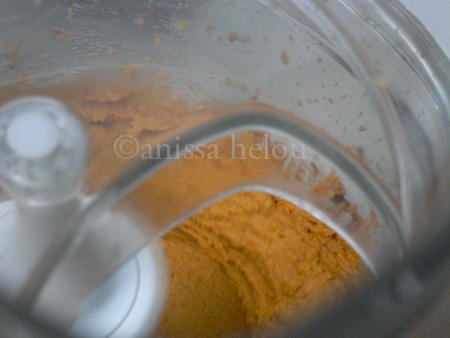 how about harife – homemade from a Moroccan recipe -it does have garlic though can’t wait to try ! This hummus sounds interesting and I will trying it this week as I am on a big hummus kick; wonder if it tastes like a cousin to the muhammara? We’ll see! A pistachio hummus sounds very intriguing! A chocolate very psychedelic. Anissa, I have made this recipe several times and everyone always loves it. I was wondering the red pepper paste, do you use a milder or a hotter one? i use a mild one which i buy in syria or in south eastern turkey. must go back there before i run out. which one do you use? I used this one http://www.tulumba.com/storeItem.asp?ic=FB469451FR974. pls suggest a link to make a good pepper paste! 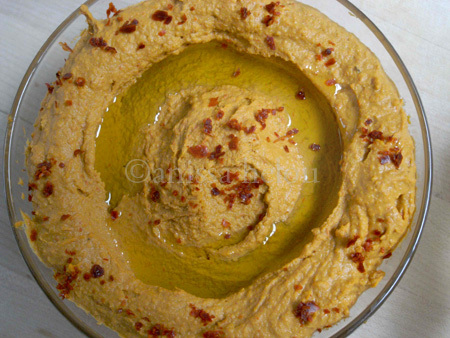 I am trying to make this delicious best ever hummus but can’t find pepper paste here in local market. Is it good enough to go with this? pls pls guide. Would love to know your recommendations on which brands or jarred chickpeas are best (and any sources in London). Thanks!